Unbelievable Storage--No other bag has this many compartments! Plenty of room for gadgets, water bottle & mini ipad. Easy access to small items. Stands Tough Against Wear & Tear--Made of durable, water-resistant polyester nylon with top-quality zippers and durable strap clip. COMFORTABLE TO WEAR--Padded ventilating back with ergonomic design for comfort. 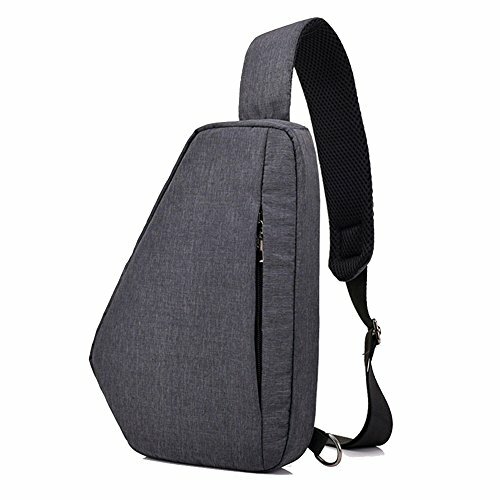 Adjustable padded single shoulder strap allows this bag to fit most people. Easily Changeable Strap Direction according to your preference. NOTE--SIZE:12.2 x 6.7 x 1.2 inches (H x L x W),can hold mini iPad or small Tablets up to 8\" ( Will Not fits Laptop).